The perfect crunchy sweet pie crust. Creamy chocolate ganache. Chocolate and raspberries. Chocolate and fleur de sel. Chocolate and nuts. So many amazing flavors and perfect combinations, you may easily think this dessert just can’t be real. But it is and it can come to life right in your kitchen in just a few easy steps. This recipe is really easy to make and you can also just use your favorite pie crust recipe instead. I decided for a spelt and almond flour combination, but you can also use just spelt or even just regular white wheat flour if you prefer. There is something so cute about portion sized desserts. And at the same time so romantic, if you share them with that special someone. And you can do just that with these delicious chocolate ganache tarts, since they are just a bit to big for you to finish yourself, but the perfect size to share with someone. The longest part about making this delicious chocolate dessert is the overnight wait. But you can easily skip this part if you are not planning on serving them after a fancy dinner and will rather just enjoy them with your special person. 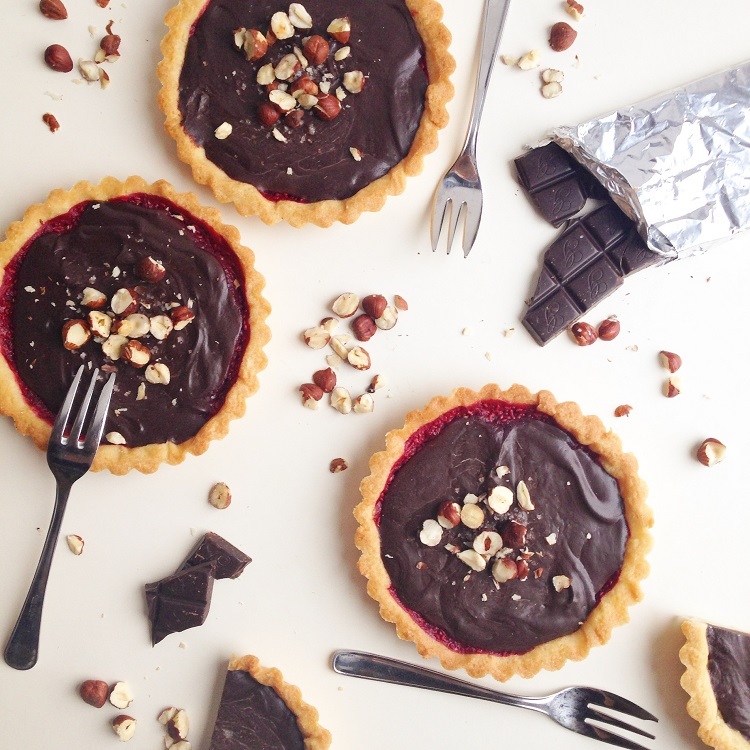 In this case, the filling will run out of the crust when you cut it, but hey, the tart will be gone in a matter of minutes anyway and the freshly melted chocolate is one of the best things in the world, right? You know what I’m talking about – that delicious melted chocolate that you lick straight from the spoon after you have decorated your cake… Mmm! 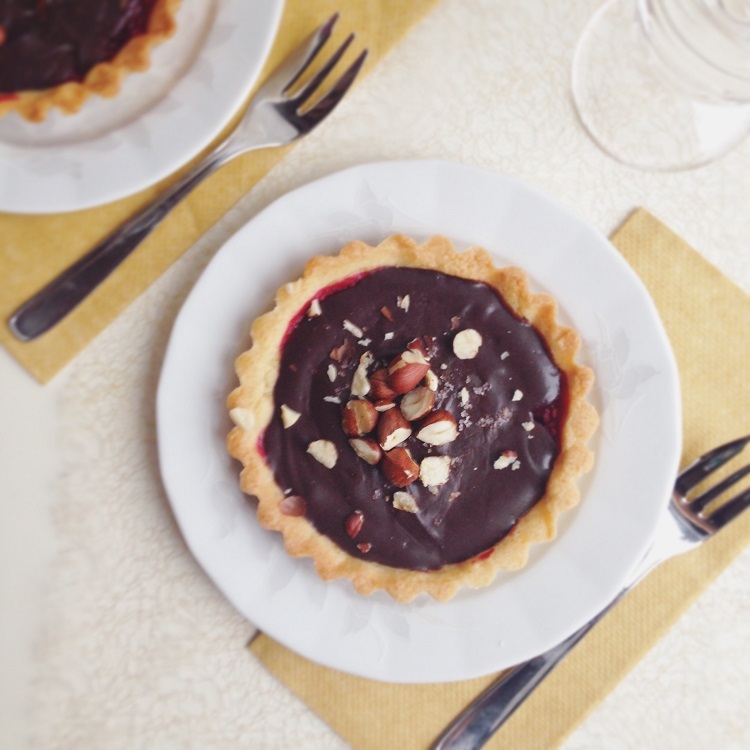 So of you go to the pantry, get the ingredients together and enjoy the making and eating of the cute and delicious chocolate ganache tarts! A timeless dessert with a delicious crunchy crust, smooth chocolate ganache and just a hint of sour raspberries for contrast. Mix all crust ingredients but butter and egg. Add butter and knead until you have broken down the butter and you get a fine crumbly mixture. Add the egg and knead until you get a nice and soft cookie dough. Place in the fridge for 30 minutes. Meanwhile, heat the oven to 180 degrees Celsius. Roll our the dough and place it in six greased loose bottom mini pie dishes. Prick each with a fork a few times. Cover with baking paper and rice or raw beans to weigh down the dough. Bake for 15 minutes, then remove the rice and baking paper and bake for extra 10 minutes until slightly brown. Let the crust cool down completely and, in the meantime, heat the raspberries on medium heat until they turn into sauce. Remove from heat. Heat the whipping cream just below boiling and pour it over chopped chocolate. Let sit for a few minutes and stir well to get a silky ganache. Add vanilla and mix well. 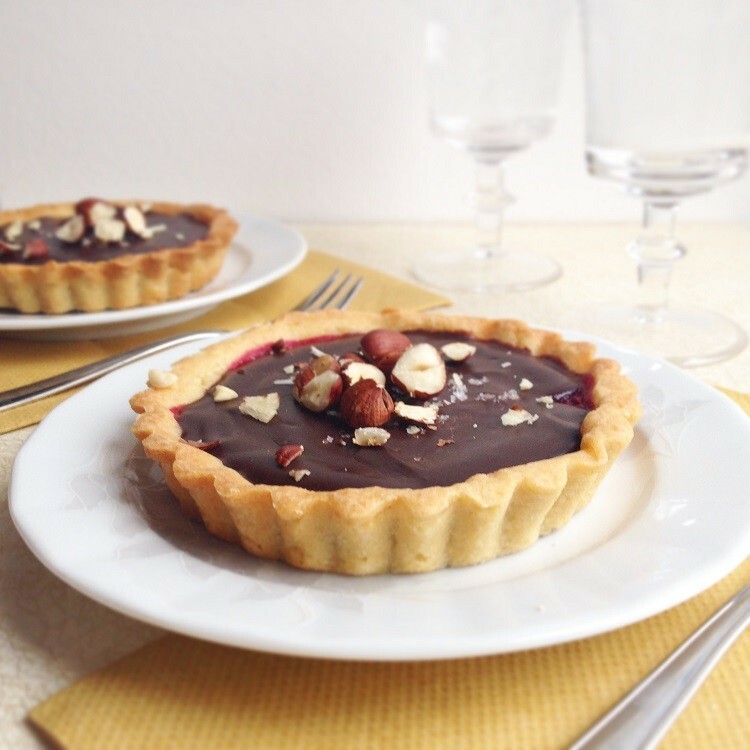 To assemble the tarts, pour a tablespoon or two of raspberries on the bottom and cover with the ganache. Sprinkle with fleur de sel if you like the flavor or just with some crushed hazelnuts. Refrigerate for a few hours. Take the tarts from the fridge an hour before serving and serve with some whipping cream.